Aries and Pisces may seem like an unlikely pair but they can be very good for one another especially if love is in the equation. Aries is a strong Sign; impulsive and fearless, when they want something, they go for it without a second thought on the outcome or possible consequences. On the other hand, dreamy Pisces is much quieter and more internally-focused. Pisceans are well known for their soothing stability. Even in the worst of storms, a Piscean will never panic and will maintain his poise. Aries and Pisces has the potential to be extremely good partners as well as friends. They both believe in sacrifices and going the extra mile to keep their loved ones happy. Pisces understands Aries in a deeper way than most other Signs do, so this can help alleviate this type of problem: Pisces knows how to keep Aries from becoming overly brash or rash. Together they form a dynamic team when they combine Aries’s directness with Pisces’s intuitive understanding of other people. Aries takes the lead, which is usually okay with the understanding Pisces. They complement each other as both of them are very open to new ideas, circumstances, or any other change that they may encounter in their life. They hit it off really well while traveling since they both like to go to offbeat, remote, and unexplored places. For Pisces to lead a happy and successful life, it is extremely important to learn how to be more assertive and practical. If Aries can manage to take charge of the relationship without dominating it, he or she can easily lead and guide the Pisces out of their shell. Aries must patiently teach and persuade meek Pisces how to be bold, more confident and decisive, the latter will feel more secure. They can have successful a relationship only if they remain equally sensitive and good-natured. An Aries man in love is “one of a kind” sentimental, foolishly generous and fiercely loyal lover for his Pisces woman. He always understands her needs and protects her in ways she has ever dreamed of. He is always available in times of need and is always by her side to celebrate success. His tendency to be possessive can cause conflicts but since she is ready to understand and trust her man, these trivial issues are ironed out easily. Pisces woman is extremely sensitive to the needs of others. In a world of takers, she plays the role of the giver. In relationship with Aries man, she plays the role of a listener and is sympathetic to his demands and needs. Sometimes he may find his Pisces lady love in a dreamy state, but this only happens when he forgets to give her attention because he is too focused chasing his goals. 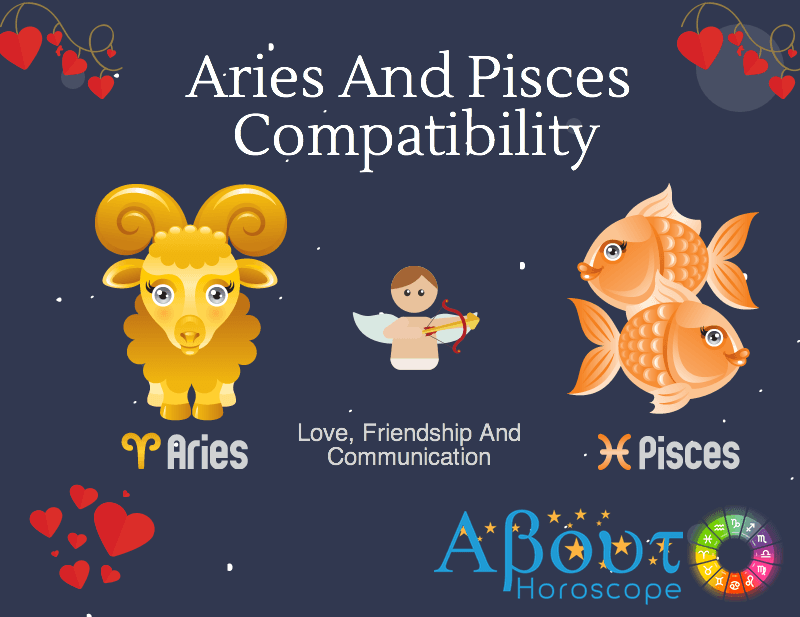 The compatibility of an Aries man and a Pisces woman is entirely dependent on their ability to adjust with and understand each other. They can either make or break a relationship. Aries man is bold and expressive whereas Pisces woman is charming and sensitive. It’s normal to have conflicts, but if both can control their temper and avoid getting into arguments on trivial matters, this relationship can reach greater heights. Astrologically speaking, it is difficult for an Aries woman to find a soul mate in a Pisces man. This relationship is not the “written in the stars” kind. But Aries woman will be drawn to mysterious, and often difficult to gauge, Pisces man. She will be attracted to the Piscean’s youthful attitude which is reflected in his physical appearance. He often looks younger than his years due to a good-humored and optimistic attitude in life. You can be guaranteed to find Aries female doing nearly all of the chasing but there will be ample opportunity for some two-way laughter. Pisces Man takes joy in lightening up the mood, making humor out of any scenario and helping others to see the fun side of life. They may have to make initial adjustments but once the understanding is reached life becomes easy for both, Aries woman and Pisces man. On a positive note, the Pisces Man has peculiar characteristics to delight her and inspire her to move ahead. In turn, an Aries woman will allure him with her mystifying behavior and treat him with kindness. If she controls her aggressiveness and he gives her own space then this relationship can sustain with love. With Aries and Pisces relationship, the differences between them become more apparent when the thrill of the chase starts to wean off. Usually Pisces admires the passion, courage and childlike innocence of Aries while latter becomes a die-hard fan of Pisceans compassion and intuition. Things go wrong when Aries pushes too hard for the indecisive Pisces to take a stand on something. Aries may find Pisces to be wishy-washy, lacking in courage or assertiveness. Pisces is turned off by the blunt words of Aries and the lack of emotional connection. Aries likes to go out and mingle, while Pisces find being around lots of people to be energy-sapping. Both are vulnerable and the bossy attitude of Aries sometimes hurt the fragile Pisces heart. Sometimes the dreamy attitude of Pisces makes the Aries feel unwanted and detached. In all, the love match between an Arian and Pisces could be either extremely conflicting or soothingly compatible. Everything depends on how far they can adjust to each other’s needs and requirements. If Aries can soften their edges and Pisces provides enough excitement, this pair has a lot to offer each other. What’s the key to a successful Aries-Pisces relationship? They really have a lot to learn from each other. Pisces shows Aries how to empathize and care; Aries teaches Pisces how to make dreams happen rather than just thinking about it! Theirs is a truly give-and-take relationship.